Avon Chiropractor Dr. Thomas Steigerwalt offers modern pain relief and wellness optimization, with special consideration given to pediatric, prenatal and geriatric chiropractic care. His mission is to help his patients attain the best quality of life possible, regardless of age, vitality level or physical condition. Stags Family Wellness is family-friendly, and prides itself on its cutting-edge peripheral neuropathy treatment protocols. 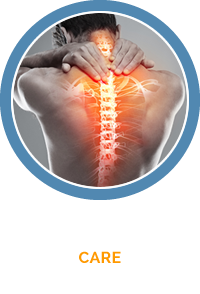 Our chiropractic care center has been described as warm, bustling and heart-centered. We feature advanced adjusting techniques that are gentle enough to help everyone from a two-week-old newborn, to a senior suffering from severe knee pain. In addition to our well-respected chiropractic approach, we also feature massage therapy, neuropathy treatment and pulsed infrared light that provides soothing relief for chronic pain patients. Because we welcome so many families to our patient-centered clinic, we strive to provide an oasis of comfort and caring; a place where everybody knows your name. 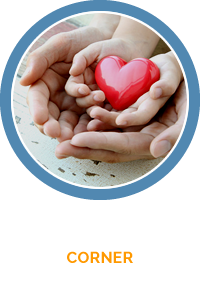 Our treatment approach is customized and personal. We love partnering with you in achieving your wellness potential. We are customer service-oriented. Because we think of you like family, you will always be treated like family. This means that we are always prepared to go the extra mile. Dr. Tom is a certified neuropathy specialist. If you suffer from numbness, tingling, prickling, burning, throbbing, freezing, sharp or jabbing pain in the hands or feet, we have the tools and expertise to help. Knee pain is one of the treatment areas in which we excel. If you have trouble going up or down stairs, getting up from a seated position or just have trouble walking, we can make a critical difference in the quality of your life. We offer our patients the best in restorative and therapeutic massage therapy. One of our specialties is helping senior citizens feel better and participate more in the activities of daily living. Our motto: It is never too late to make a difference. We encourage you to try our geriatric chiropractic services. Our pediatric and pregnancy chiropractic programs are designed for children to thrive and expectant moms to experience an optimal pregnancy. Our care is safe, effective and gentle. The compassionate and skillful care at our location is supportive and patient-centered. 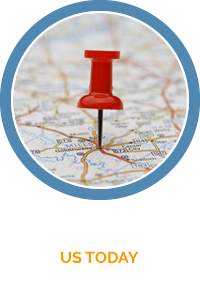 Contact us today for a convenient appointment with our chiropractor Avon. I came to see Dr. Tom after months of my daughter and wife telling me to give it a try. For years I’ve lived off taking many dosages of 600mg ibuprofen for my lower back and hip pain. After just a week of treatment with Dr. Tom I was able to stop taking the ibuprofen. I am now pain free with my lower back with only occasional pain from my hip that is managed by the treatments. I came to the office with pain full bone on bone in both knees. It was difficult for me to move my right leg and drive my vehicle. Treatments have helped my knees. I can climb and descend stairs and walk heel to toe much better. I can move right leg on its own and do not have problems driving. The pain is much more manageable. Office treatments have been good for me. What a very friendly and comfortable place to be helped. I went to Dr. Tom for a lower back problem and in my legs. He has helped me. My back and legs are much better. He is very good. Thank you Dr. Tom. I was having some trouble with my left knee and Dr. Tom’s x-rays showed that my spine wasn’t quite in line. The treatments took care of my knee pain and he also helped with some neck and shoulder discomfort. I am fine now. 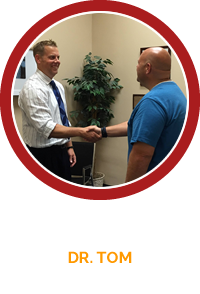 Dr. Tom and his staff are very friendly and make you feel like family. Dr. Tom is great. He took time to listen to me and explain treatment. He even called me on a saturday to see how I was doing. Wow, No Dr does that but my vet. I am truly impressed. The staff is great as well. They are always smiling and so helpful. And my knee is showing improvement already and I just started a short time ago. I recommend everyone with pain to see Dr. Tom. Before I came to Dr. Tom my back was keeping me out of sports and it was hard to walk and sleep. During my appointments I have rapidly been getting better. After a while I could sleep, walk and play sports pain freely. Dr. Tom has helped me in so many ways and he is a great guy also. When I first started seeing Dr. Tom I was getting migraines just about every day if I didn’t take any medicine, but after coming and going through the exercises and adjustments I am now medicine free and migraine/headache free. Very friendly staff! I would highly recommend them. Dr. Tom has helped relieve lower back problem I’ve had for years. He has also helped with neck and shoulder pain. I feel so refreshed after each visit and am very happy I made the decision to see him. The entire team is very friendly and helpful. Looking forward to our treatments. Dr. Tom answered all of our questions and took time to listen to us. We feel welcomed and truly cared for. In September I had my first consultation and treatment with Dr. Tom. In July I was having discomfort (pain) in my right arm and my right leg. I had much discomfort lowering myself into my car and also getting out of my car. I’m happy to refer and recommend Stags Chiropractic. My discomfort and pain appears to be gone 98-99%. Dr. Tom – Thank you! I walked in the door in tears. I hadn’t slept in three weeks. After one treatment I slept 6 hours that night! I’m not back to normal yet but I’m already feeling better after each visit! Thank you from the bottom of my heart! When I first met Dr. Tom I lived with constant hip and back pain. After Dr. Tom did the x-rays he told me that my hip bones weren’t even and my spine was curved way out of line, so when I walked it put pressure on my hips. I am now 80% free of pain. I sit and walk straighter than before. Thank you Dr. Tom! I have been suffering with neuropathy in both my feet for at least the last 25 years due to diabetes. Since I have been undergoing treatments at Stags Family Wellness with Dr. Tom I can honestly say that the burning sensation has subsided. I can also say that my pain due to the neuropathy before the treatments was a 9-10 and now the pain is a 5-6. I have had lower back pain for quite some time. A year ago my upper right arm started to hurt. With DR. Tom’s treatments my back ache is gone. My right arm is getting better. The pain isn’t quite as bad as it has been. I never thought that a chiropractor could get rid of the pain. I am amazed at the way I feel after each visit, what a wonderful experience I have had with Dr. Tom and his staff, I would highly recommend Stags Family Wellness to anyone that wants to see a difference in the way they feel, I sure have! I have been seeing Dr. Tom for lower back, neck and shoulder pain. Since seeing Dr. Tom, pain has reduced by about 90% of the time and the headaches are further apart and less severe. Ability to raise arms and neck movement is better than has been in a long time. My energy level has increased since Dr. Tom’s treatment. When I started coming to Dr. Tom I was having backaches and headaches frequently. Now it seems the only time I hurt is when I’ve done some hard work. I have been off my sinus pills a whole month without any problems. I also can walk without limping as much. Two years ago I was told I have acute osteoarthritis. I’ve been on pain pills and therapy and neither helped. Before Dr. Tom I could barely walk, needed help getting dressed and was in pain 24 hours a day. Now after only 2 weeks I walk much better, can stand straighter and the pain is almost gone. Thanks Dr. Tom. Before seeing Dr. Tom, headaches were a daily occurrence. Neck pain has also been an issue, which is actually part of the headaches. It feels great to wake up in the morning headache free. I am very glad I found Dr. Tom’s flyer and gave it a shot. Great find. Thank you Dr. Tom. I appreciate the thoroughness and caring of the entire staff. I trust each of them has my best interest in mind and I’m confident they will help me on my journey to pain relief. Thank you Stags Family Wellness! When I contacted the office they squeezed me in for treatment. My neck and shoulder pain was so severe I could not do any of my favorite activities (golf and mowing the lawn). Dr. Tom took time explaining my best course of treatment. He got me back to normal. I was mowing again but my golf game has yet to improve. I trust him so much I referred my boyfriend to him. I had numbness in my feet and burning and stinging too. My feet were always cold. I couldn’t walk up steps. After treatments with Dr. Tom, I no longer have cold feet or burning or stinging. I also can go up steps and I walk a lot better. Dr. Tom is a wonderful caring person and I’m glad I met him. When I walked into Dr. Tom’s office I was in so much pain that I had to sit down a few minutes before I could talk to them. My back did not want me to move. Now its 2 months later and I walk like I’ve never had a pain in my life. I’m very thankful for Dr. Tom and the treatments he gives. I suggest that everyone give him a chance to show them that there is help if you really want it. When I came to Dr. Tom I was having lower back pain, pain down my leg, shoulder pain and many headaches. My outlook on what he could do for me was grim. I am happy to report after going through his program, my lower back pain and leg pain are gone, along with my headaches! Woo Hoo! Many thanks to DR. Tom. You are a blessing from God. Amazing doctor. Went above and beyond for us/my daughter to try to find answers and a solution. I would not hesitate to see him again or send any of my family members to see him. Diane at the front desk is also very sweet and caring. Before I met Dr. Tom my family doctor sent me to physical therapy for my back. I went there for 5 weeks with no improvement. I found a flyer for Dr. Tom in our mailbox so we decided to try chiropractic. After 3 months I have more energy and not as tired as I used to be. I can move around without almost no discomfort in my back. I am so thankful for all Dr. Tom has done for me. Staff is so friendly, caring, and competent. It is a pleasure to visit this practice. Extremely professional and friendly. They have become family! I’ve had pain in my lower back for years when doing work around the house and when driving more than 3 hours. After hearing Dr. Tom at our weekly community meeting (Jolly 60s), I decided to try chiropractic. I can truthfully say I’ve had no pain this summer. I’ve also noticed that my posture has improved. Chiropractic has definitely enhanced my life and made my body healthier.